At 11:15 p.m. last night, a tip was received about the suspect inside a residence in the 1600 block of Juneau Street. When officers arrived, the suspect ignored commands to exit the residence. The suspect barricaded himself inside with his family members and continued to ignore officer’s commands to exit. As a result, SWAT was requested and activated. Negotiations continued throughout the night and into this morning. At 5:45 a.m., Kuach Kuach exited the residence, was taken into custody and arrested without incident. The victim has been identified as Devan McDonald (22-years-old). Detectives believe Kuach is the lone suspect in this investigation and are not looking for additional suspects. Detectives are asking for the public’s help in locating the suspect in this investigation. 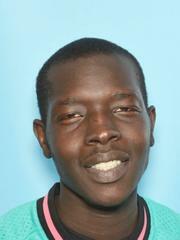 An arrest warrant has been issued for Kuach Chuol Kuach (20-years-old). He faces multiple charges including Murder 1. He is to be considered armed and dangerous. Don’t approach him. Anyone with information on the suspect’s whereabouts and/or this investigation is asked to call Police Dispatch at 786-8900 (press “0” for an operator). To remain anonymous you may contact Crime Stoppers at 561-STOP or online at www.anchoragecrimestoppers.com. Officers are on the scene of a homicide investigation in the 600 block E. 9th Avenue. The preliminary investigation has found an adult male was found inside an apartment with a gunshot wound to the upper body. He was pronounced dead at the scene. No additional information is available to release at this time.